Have you always wanted to dive with Tiger Sharks, or Sand Tiger Sharks (Ragged Tooth Sharks), or Scalloped Hammerhead Sharks? Now’s your chance! Spend 5 full days / 6 nights diving with either Tiger Sharks, or Sand Tiger Sharks (Ragged Tooth Sharks), or Scalloped Hammerhead Sharks, on arguably the top Shark Diving destination, worldwide – Protea Banks in KwaZulu/Natal, South Africa! Please remember shark diving is to a large extent seasonal. You can’t dive all species of shark, Tiger, Sand Tiger and Scalloped Hammerheads in one 5 days / 6 night dive trip! Tiger Sharks (Galeocerdo cuvieri) are found in great numbers on Protea Banks during the months of March, April, and May. 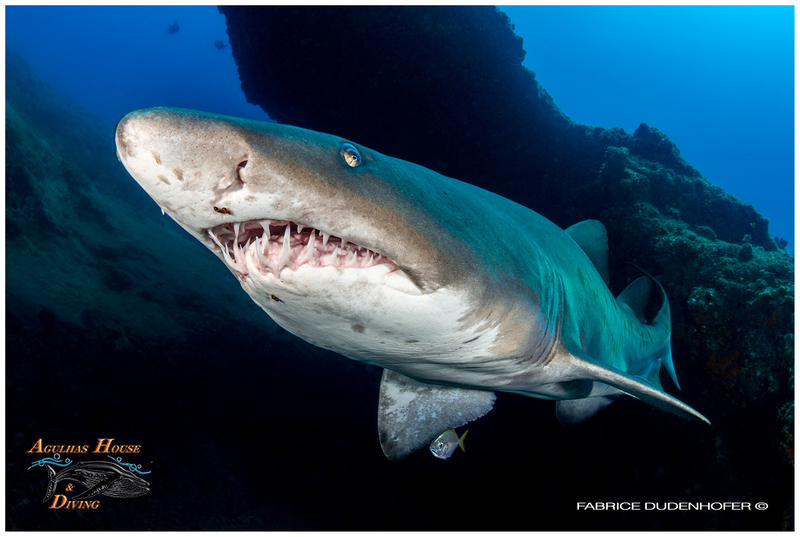 Sand Tiger Sharks or Grey Nurse Sharks or, Ragged-tooth Shark, “Raggies” (Carcharias Taurus) as they are commonly, and affectionately called, are also found in great numbers on Protea Banks during the months of June, July, August, and September. Scalloped Hammerheads (Sphyrna lewini) are found in their hundreds, shoaling on Protea Banks during the months of September, October, November, and December. Please bear in mind that August, September, & October are historically “windy” months off the coast of KwaZulu/Natal. In addition to the above three “target” species of shark, you also stand an excellent chance of encountering Oceanic Blacktips, and Bull Sharks on most of your dives as these species are found on Protea Banks all year round. If your “target” species are the “Raggies” (June – September) or the Scalloped Hammerheads (September – December), you stand an excellent chance of encountering Humpbacked Whales! Please note, the Sharks have not read this timetable and have no idea where they are meant to be and when! Please note that all reef dives on Protea Banks are restricted to advanced divers only. This rule is strictly adhered to due to the depth of the dives, in excess of 30 meters, and the strong currents that are often present on Protea’s deep reefs. There is no dive qualification needed for a baited shark dive on Protea as this activity can be done on snorkel. If you wish to do the dive on scuba, an open water 1 certification is required. Arrive King Shaka International Airport - Durban (DUR), own arrangements. On arrival you will be met by Dive The Big 5 for the 160 km / 2 hour road transfer from King Shaka International Airport to Shelly Beach, on the KwaZulu/Natal south coast. On arrival in Shelly Beach, before going onto your accommodation establishment, Breakerview, you will go past Aqua Planets 5 Star PADI Dive Centre to meet Kym and her crew who will host your diving, and introduce you to your sharks of choice, for the next 5 days diving, and to choose and select any tanks, weights, air and any other dive gear you may require. Kym and Co will also tell you at what time you must meet Aqua Planet at the Sonny Evans Small Craft Harbour for the following days dive. The Sonny Evans Small Craft Harbour is 40 meters from Breakerview. After the introductions and gear selection you will continue on to Breakerview, which is a few kilometres from Aqua Planet's dive shop. Breakerview is also situated within easy and safe walking distance of Shelly Centre, which is a large Mall housing supermarkets, banks, fast food outlets, and liquor stores, where you can purchase necessities, plus loads of restaurants and pubs, and a movie house complex. Rest of the evening free. Overnight at Breakerview on a bed only basis. “Meet & Greet” at King Shaka International Airport - Durban; road transfer from King Shaka International Airport – Durban to Breakerview - Shelly Beach; accommodation. Domestic and international air; breakfast; lunch; dinner; bar; items of a personal nature; gratuities. At a time advised the previous day, when you stopped by Aqua Planet, you will walk the 40 meters from Breakerview to AquaPlanets kit-up area in the car park at the Sonny Evans Small Craft Harbour. The Aqua Planet's crew will meet you there with all your gear, ready to go diving! Your first days diving on Protea Banks is scheduled for a “baited” shark dive, as the first dive of the day, followed by a deep, Protea Reef Dive, weather permitting, as the second dive. Please note that all Protea reef dives are deep dives, in excess of 30-meters, and are restricted to advanced divers only. We say “scheduled” because weather conditions may force the skipper and DM to change the order in which we do baited shark dives and the deep reef dives on Protea. After meeting the Aqua Planet dive crew, at a time confirmed the previous day, in the parking lot in the Sony Evans small craft harbour, which is also the base for the local NSRI (National Sea Rescue Institute), you will kit-up and have the pre-dive briefing. Your dive gear will be stowed on-board by Aqua Planets crew, and the 4x4 pick-up (bakkie) will reverse the dive-boat as close to the water as possible. Everyone then assist the Aqua Planet crew launch the dive boats, which are either a 7.5 meter “duck,” or a 8 meter “duck or RIB, or semi-inflatable, nose first, into the surf. On the skipper’s instruction, the ladies board first, after which the men clamber into the “Duck”, placing themselves opposite their gear, which was been stowed down the centre of the “Duck.” You then quickly put on your lifejackets, place your feet in the foot-straps, and off you go……… The launch itself is an exciting experience, and is likened to “white water rafting in a wetsuit”. After punching your way through the pounding surf, on reaching the calmer waters, the skipper pauses to see that all is ok, before you continue on to the dive site. On arrival at the dive site, we start chumming to attract the sharks, and put out a buoy with the bait, which is contained in a “shark friendly” round “camo” drum with holes in it, so that the “smell” and oil from the sardines in the “drum” permeates into the water. When the first sharks appear, the DM assesses the situation, and if he is of the opinion that the sharks are going to stay around awhile, and that they are not aggressive, the divers may enter the water. You either view the action from the “safety” of the boat, or, for non-certified divers, on snorkel; you float on the surface of the ocean and watch the action as it unfolds, 5 meters below you. The certified divers, already kitted up, descend to about 10 meters, to the depth of the camo drum, and follow the action from there. This is a drift dive, as the boat, chum, and bait, is drifting with the wind and surface current, as are the divers at 10 meters below. After the baited dive we return to the Sonny Evans Small craft Harbour, swop tanks, and immediately re-launch the boat for the second scheduled dive of the day, a deep Protea Reef dive. To have breakfast in between the baited shark dive and the deep reef dive is impractical, and time consuming, as the wind picks up rather quickly as the morning wears on. It is advised to have breakfast of 2 fried, or scrambled eggs, a pork sausage, bacon, fried tomatoes, fried onions, two slices of toast with tea / coffee at the Shelly Beach Ski-boat Club after both dives have been completed. There is no SIT required between the first baited shark dive and the second deep Protea reef dive as a “baited shark dive” is not a deep dive, more like a 10-meter “bounce” dive at most! Once over the dive site, the skipper cuts the motors and the divers, as well as the DM, kit up, on the boat. This is a fully guided reef dive with the DM leading the dive. Once every diver has kitted up the Skipper repositions the boat over the reef, and on the DM’s signal, all the divers do a backward roll, simultaneously, into the water. All Aqua Planet’s Dive Masters, who have dived Protea for years, have mastered the art of safe diving on Protea. The DM first descends to 5 meters and waits at 5 meters until all the divers on the boat get down to him/her. Once all the divers are at 5 meters, the group descends together, to the bottom, which is at about 30 meters. Those divers that are heavy breathers are buddie paired off, so that when they get low on air, they surface together as a pair. After the Protea Reef dive, you will return to the Sonny Evans Small-craft Harbour where the boat is winched out of the water. All your dive gear will be taken back to Aqua Planets dive shop to be washed down, rinsed, and dried for the following days diving. The rest of the afternoon / evening is free. Local places of interest include, Pure Venom Reptile Park, Crags View Wild Care Centre, the Margate Art Museum, Uvongo River Nature Reserve, Oribi Gorge, which is a 20 km drive from Shelly Beach, The Wild Coast Casino, which is nearby, a coffee farm in the neighboring town of Ramsgate. If you are a golfer…… lots of top-class golf courses in the vicinity, surfing, fishing etc. etc. The folk at Aqua Planet and Bruce & Belinda, your hosts at Breakerview, will be happy to point you in the right direction. Any additional dives and local touring would be for your own account. Overnight at Breakerview on a bed only basis. Breakerview is a self-catering Guesthouse, situated 40-meters from Sonny Evans Small-craft Harbour, 40-meters from Shelly Beach itself, which is a beautiful bathing beach, and has a magnificent tidal sea-water pool. Breakerview consists of 6 en-suite, air-conditioned, fully equipped, daily serviced, self-catering rooms. Two are 2-sleeper rooms. Two are 4-sleeper rooms, all sea-facing. Plus one, non-sea facing, 4-sleeper room. Ideal for a group of 10 divers sharing, but can accommodate 16 divers at a push. It has a beautiful pool, and braai (barbeque) facilities. The supermarket, 10-minutes’ walk, where fresh produce, and meat, for the evening “braai” can be purchased. A number of liquor stores are also close by, for beer and for where those well-known South African wines can be purchased. Shelly Beach Ski-boat Club, where you will have breakfast daily, also has the club bar where you can meet the locals, and an a la carte restaurant which is open for breakfasts and lunches from 08h30 till 15h30 daily, at ridiculously cheap prices. Breakfast at the Shelly Beach Ski-boat Club, consisting of a hot English breakfast of 2 fried, or scrambled eggs, a pork sausage, bacon, fried tomatoes, fried onions, two slices of toast, and tea / coffee; hire of tanks, weights, and air, or full equipment hire, depending on the dive package required; services of a qualified dive master to lead all dives; 1 x baited shark dive followed by a guided Protea deep reef dive, weather permitting; accommodation at Breakerview on a bed only basis. Gear hire, other than tanks, weights, & air, depending on the package; additional dives, touring & entry fees; lunch; dinner; bar; items of a personal nature; gratuities. Three full days spent doing 2 x deep Protea Banks Sharks Dives, weather permitting. The target species being determined by the time of year you elect to dive on Protea. Tiger Sharks during the months of March, April, and May. Sand Tiger Sharks during the months of June, July, August, and September. Scalloped Hammerheads during the months of September, October, November, and December. Please refer to the exact tour dates below. At a time as advised the previous day, you will walk the short distance from Breakerview to the Aqua Planet kit-up area in the Sonny Evans car park. After launching the boat and the 20 to 30 minute boat ride out to Protea Banks reefs, and once over the dive site, the skipper cuts the motors and the divers, as well as the DM, kit up on the boat. This is a fully guided reef dive and the DM leads the dive. Once every diver has kitted up the Skipper repositions the boat over the reef, and on the DM’s signal, all the divers do a backward roll, simultaneously, into the water. The Dive Masters, who have dived Protea for years, have mastered the art of safe diving on Protea. The DM first descends to 5 meters and waits at 5 meters until all the divers on the boat get down to him/her. Once all the divers are at 5 meters, the group descends together, to the bottom, which is at about 30 meters. Those divers that are heavy breathers are buddie paired off, so that when they get low on air, they surface together as a pair. After the Protea Reef dive, you will return to the Sonny Evans Small-craft Harbour where the boat is winched out of the water. All your dive gear will be taken back to Aqua Planets dive shop to be washed down, rinsed, and dried for the following days diving. The rest of the afternoon / evening is free. Overnight at Breakerview on a bed only basis. Breakfast at the Shelly Beach Ski-boat Club, consisting of a hot English breakfast of 2 fried, or scrambled eggs, a pork sausage, bacon, fried tomatoes, fried onions, two slices of toast, and tea / coffee; hire of tanks, weights, and air, or full equipment hire, depending on the dive package required; services of a qualified dive master to lead all dives; 2 x guided Protea deep reef dive, weather permitting; accommodation at Breakerview on a bed only basis. Your last combination “Baited” Shark dive / deep Protea reef dive, weather permitting. In between the 1st and 2nd “baited” / deep Protea reef dive, or after both dives have been completed, depending on the decision of the Skipper & DM, you will return to Sonny Evens Small-craft Harbour and the Shelly Beach Ski-boat Club for a hot English breakfast. The rest of the afternoon is free. Overnight at Breakerview on a bed only basis. Day 7: After breakfast at the Shelly Beach Ski-boat Club, at a time to be advised depending on your outward flight departure time, you will be collected from Breakerview by Dive The Big 5 for your 160 km / 2 hour return road transfer to King Shaka International Airport – Durban. End of services. Breakfast at the Shelly Beach Ski-boat Club, consisting of a hot English breakfast of 2 fried, or scrambled eggs, a pork sausage, bacon, fried tomatoes, fried onions, two slices of toast, and tea / coffee; return road transfer from Breakerview in Shelly Beach to King Shaka International Airport – Durban. Lunch; additional touring; dinner; accommodation; onward flight out of King Shaka International Airport – Durban; bar; items of a personal nature; gratuities. Please be advised that when diving anywhere in South Africa don’t expect to do more than 2 dives a day. By noon, along the entire east coast of southern Africa, the wind tends to pick up quite a bit, causing white caps on the ocean and making diving conditions difficult and even dangerous. As all dives are drift dives, it’s very difficult for the skipper of the “Rubber Duck” to spot the surface marker buoy in rough conditions, and even more difficult to spot individual divers as they surface after their dive. Follow up a fun week of shark diving with a customized land-based safari.